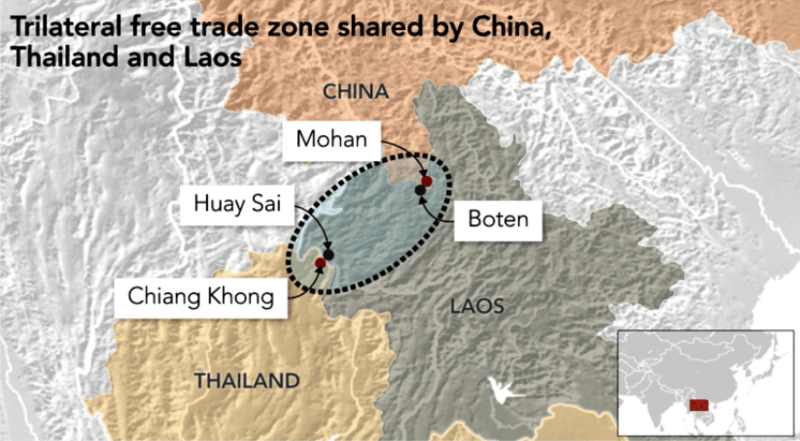 As the trade war with the U.S. intensifies, China is looking to strengthen commercial ties with countries in the Mekong region of Southeast Asia by setting up a free-trade zone on the border between Thailand and Laos. In the planned zone, Beijing will waive tariffs and value-added tax on imports from countries that do not share a border with China. “This is the first time that China has offered special privileges via border trade to have closer ties with the Mekong countries and finally to the whole of ASEAN,” said Danaitun Pongpatcharatorntep of Chiang Mai University’s China Intelligence Center. President Xi Jinping vowed last week to import $40 trillion worth of goods and services over the next 15 years — a figure that includes products from Mekong nations. While that speech was seen as a bid to counter criticism from U.S. President Donald Trump over Beijing’s trade practices, China’s move to boost commercial ties in the Mekong region appears to be a way to mitigate the fallout from the trade war. China has poured $1.7 million this year into the Lancang-Mekong Cooperation — an initiative proposed by Thailand to develop the region. The cooperation came up with the idea of extending the China-Laos border free-trade zone to the Thai-Laos border. This is the first time that China has offered special privileges via border trade to have closer ties with the Mekong countries. Thai Commerce Minister Sontirat Sontijirawong said Thailand will take the lead in setting up talks between China and Laos to finalize a framework for the trade zone, which is expected to be completed in the next few years. Oramon Sapthaweetham, director-general of Thailand’s Trade Negotiation Department, said the trade zone will cover an area stretching from the southern Chinese border district of Mohan to Chiang Khong in far north of Thailand. China has already signed a memorandum of understanding with the Laotian government to study a project to shorten travel times on the R3A highway that links the southern Chinese city of Kunming with Huay Sai in Laos and Thailand’s Chiang Khong. Work has also started on the Bangkok-Nong Khai high-speed rail line, which is planned to eventually link with Vientiane and Chinese rail routes. The southern China region has a population of 47.4 million people, a total gross domestic product of 1.4 billion yuan ($201 million) and is growing around 8% a year, according to the Bank of Thailand. Beijing also intends to use the project to capitalize on growing demand for cross-border e-commerce. The Chinese government has built up such facilities and logistics infrastructure with a one-stop customs services in Mohan and other locations along its southern borders. “Thailand is also interested in developing its e-commerce in Mohan and is about to set up Chiang Mai as an e-commerce hub aiming to export more products to southern China,” Oramon said. She said the free trade zone will also be a way for Thailand and the Mekong countries to profit from China’s flagship Belt and Road initiative by exporting into the European market via China’s western border with Kazakhstan.